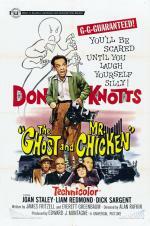 Buy or Rent The Ghost and Mr. Chicken (1966) Movie DVD & BluRay Online! Movie Plot: Luther Heggs aspires to being a reporter for his small town newspaper, the Rachel Courier Express. He gets his big break when the editor asks him to spend the night at the Simmons mansion that, 20 years before, was the site of a now famous murder-suicide. The case has aroused local interest not only because of the anniversary but due to the fact that the family heir, Nick Simmons, has returned to Rachel aiming to tear the mansion down. Luther’s account of his wild, ghost-ridden night in the house leads Simmons to sue for libel, but with the aid of his friend Kelsey they determine what exactly happened that night long ago and the identity of the real killer.